A set of points at the centre of an investigation into Tuesday's Tube derailment had been the scene of maintenance work the night before. Metronet, which maintains the track, said they would be looking into their work after the incident near White City station, west London, at 1227 BST. Some 150 passengers were led to safety after the seventh car of the eight-car train derailed on the Central Line. The westbound line remains suspended between North Acton and Marble Arch. No-one was hurt and services are expected to resume on Wednesday morning. A Metronet spokesman said: " "We don't know if our recent work and the derailment are connected and we are looking into the work we've been doing." The maintenance work was being carried out on the track on Monday night in an attempt to remove the 20mph speed limit, which had been in place on the section of track since April last year. Metronet is responsible for maintenance on two thirds of the Tube and took over the Central Line at that time. Bob Crowe, general secretary of the Rail, Maritime and Transport Museum union (RMT) said it was "lucky" the speed restriction was in place. He said: "However, this particular speed restriction has been in place for months, and serious questions need to be asked about why remedial work has not been carried out by the privatised infrastructure companies now responsible for maintaining the Underground." 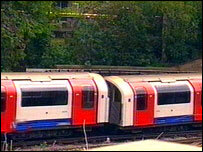 London Underground (LU) said the rolling stock was unlikely to have caused the derailment. LU said: "The initial investigation has focused on the track. The derailment occurred at a set of points that were immobilised while they were awaiting further track work." In January 2003 a Central Line train derailed and hit a wall at Chancery Lane station in central London, injuring 32 people. And seven people were hurt in October when a Northern Line train derailed at Camden Town, in north London. That incident occurred two days after a Piccadilly Line train derailed in west London. "All the passengers were evacuated from the train"